Sea cucumbers – sausage-shaped marine animals with soft, cylindrical bodies – can usually be found on the seafloor where they gather together in large herds. Suckers on their tube feet allow the animals to stick to the ocean floor as they crawl along in search of food. 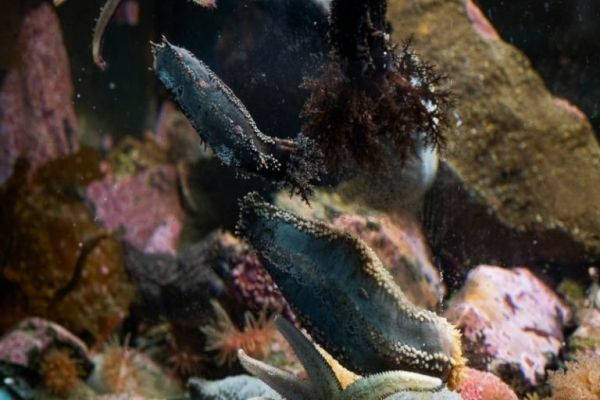 “I thought it was weird behaviour for sea cucumbers, but figured a storm might have detached them from the seafloor, and then I forgot all about it,” said Dr. Mercier, professor, Department of Ocean Sciences, Faculty of Science. Continue reading at Memorial University of Newfoundland. Image via Memorial University of Newfoundland.